A happy Todd Rickard, pleased no doubt with the turnout – 20 visitors from around the world. The fact that the offshore forecast continues to be gale force easterlies, with very rough seas, also has Todd smiling. 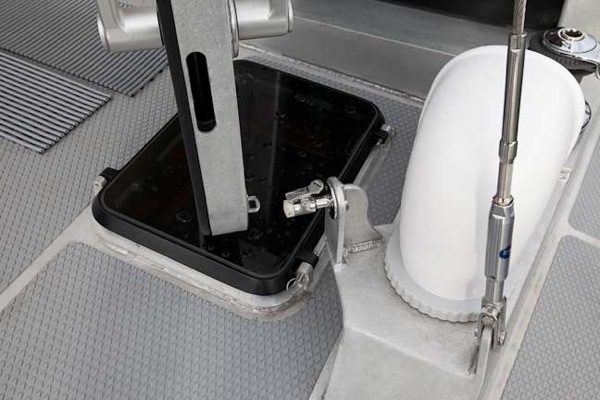 Osprey’s aft deck has a bait well and cleaning station. 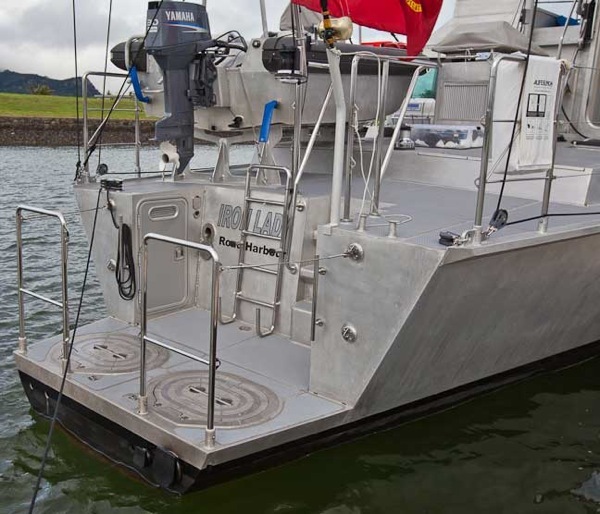 Her bolt on swim step extension, originally added for landing fish, is what gave us the idea of the hull extension. Iron Lady’s extension has aided efficiency and improved on what already was a nice motion uphill. Pete Rossin (right) and Debbie Rossin have been very patient hosts, as has John Gowing. 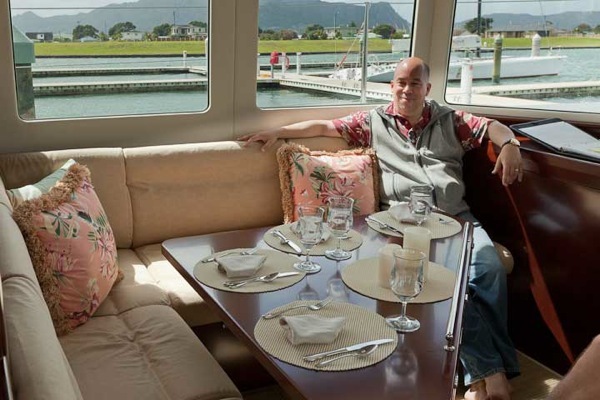 Owners rightfully want to get away and cruise, and delaying this for an open house, and then giving rides to three boat loads of strangers, is a sacrifice which we all appreciate. 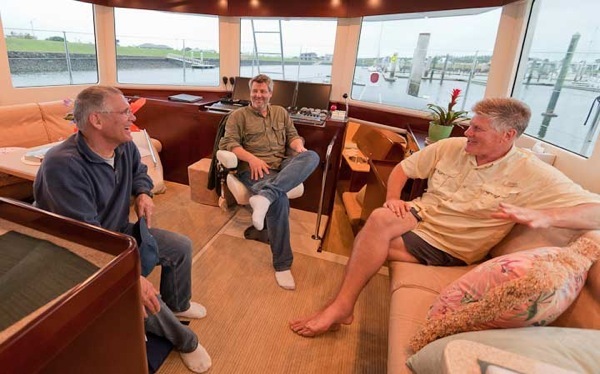 Happy owners have always been our marketing strategy, and the committment of new owners to hulls five and six, is in no small part due to their efforts. 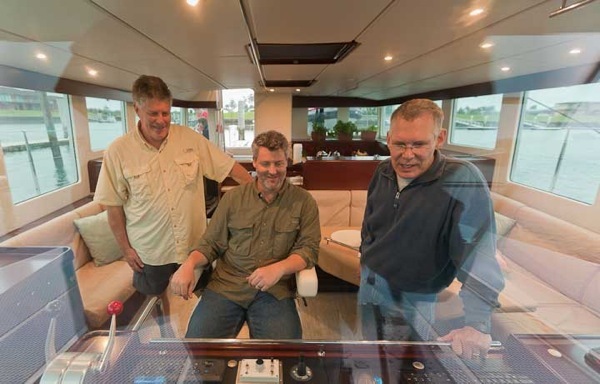 In this photo Pete, Todd (middle) and a guest are discussing the finer points of cruising. 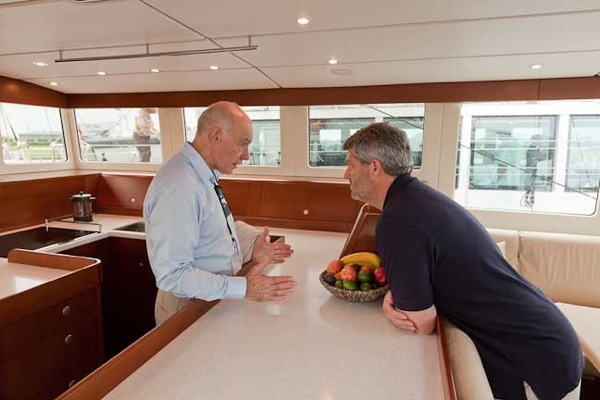 Speaking of discussions, we often learn from our customer’s questions and requests. Several excellent ideas came out of the open house. Osprey’s timber is a lighter color than the earlier FPB 64s. Many of our visitors had to take two or three flights to make it to the open house, the longest trip of which was from Central America via Los Angeles. They all seemed pleased with the experience, except those currently with cruising yachts, who may now not be as content as was previously the case. 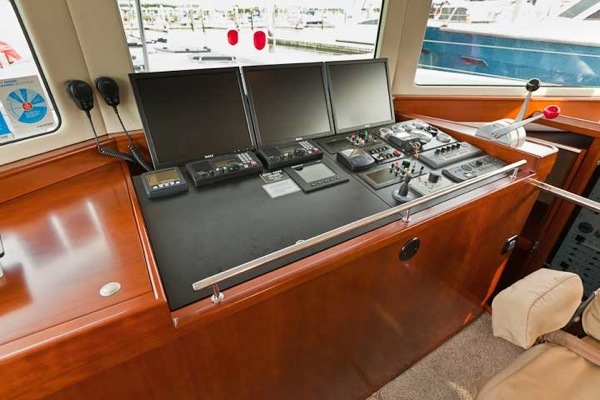 Nav systems and the bridge are always a subject of great interest. This is Osprey’s bridge set up. 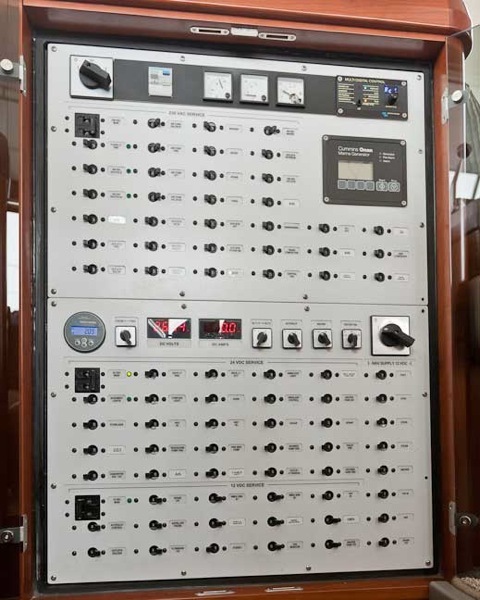 There is a combination AC and DC panel adjacent to the bridge. 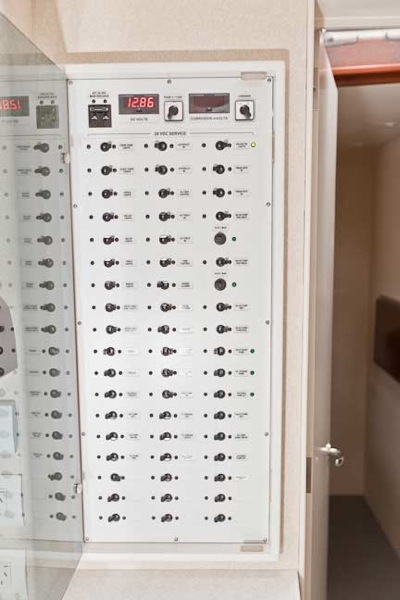 These breakers and selector switches control the items to which you need access on watch. A second panel, this one DC only, is at the aft end of the office. Between the two there are obviously a lot of separate circuits. 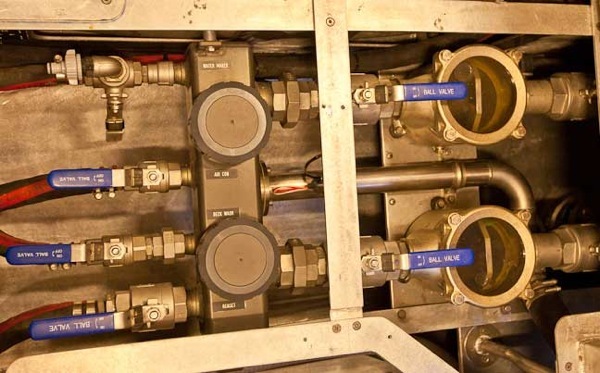 This aids in tracing faults later in the yacht’s life. Debbie Rossin is showing off the sliding door into the forward owner’s suite. We are looking forward to seeing Iron Lady when Debbie gets through with her decorating. Heads are always hard to photograph, and convey the sense of space. 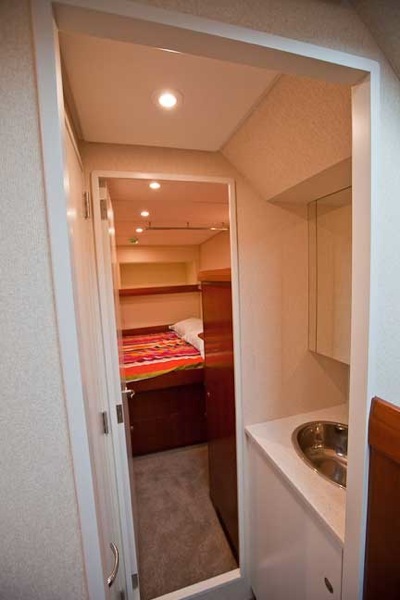 This is in the forward suite, and is designed to increase the sea state in which it can be used. If there is too much space, you get thrown around. 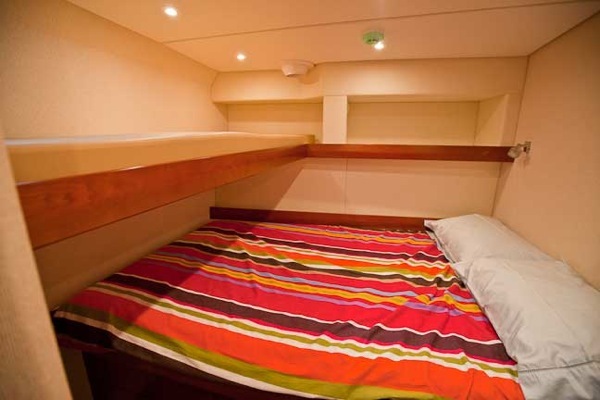 The combination of the layout, and the FPB 64’s soft motion, will make this usable into moderately rough conditions. 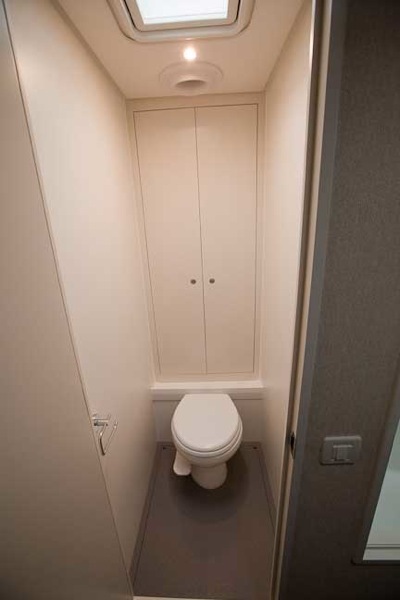 Note that on a sailboat we always place the toilet facing fore and aft. But as the FPBs are quite steady in terms of heeling, the awthwartships placement is used to give better control when used in a headsea. On Wind Horse we use this locker in the head for linens and towels. Osprey has a different aft head design. 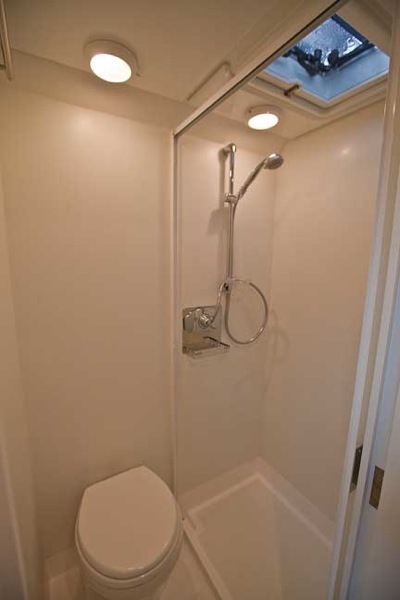 The sink and vanity has been moved out of the toilet/shower compartment. This makes the latter much nicer, at the cost of some storage space (of which there is much elsewhere). 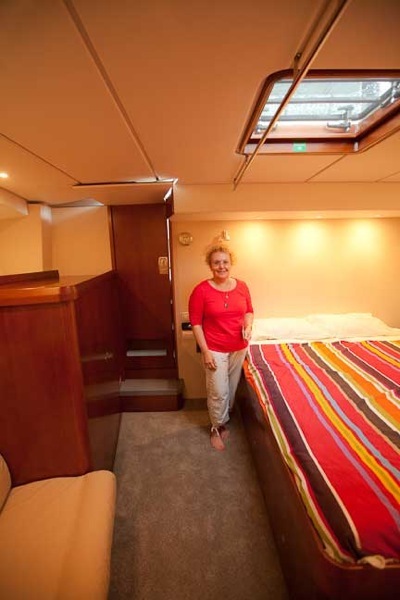 Looking into the aft head and shower. Now this is really tough to show. 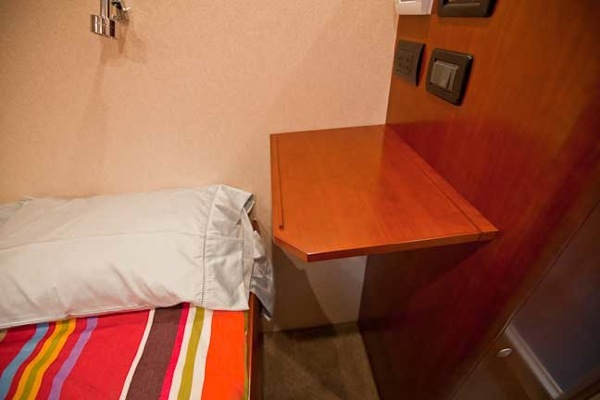 There is an athwarthsips single berth above the fore and aft double. 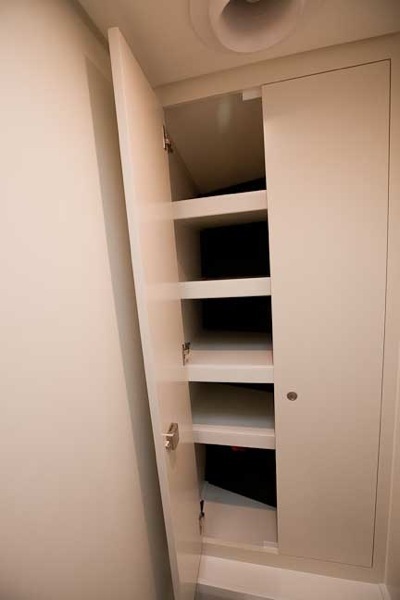 This is a great place to stow items to which you want easy access, such as camera bags, computers, etc. On the other hand, it costs visual space, and you lose the aft bulkhead for placing art. 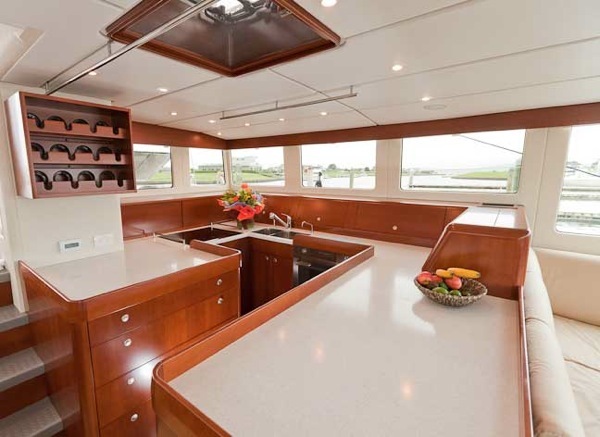 Many of the FPB 64s have added these hinged tables in the aft cabins. 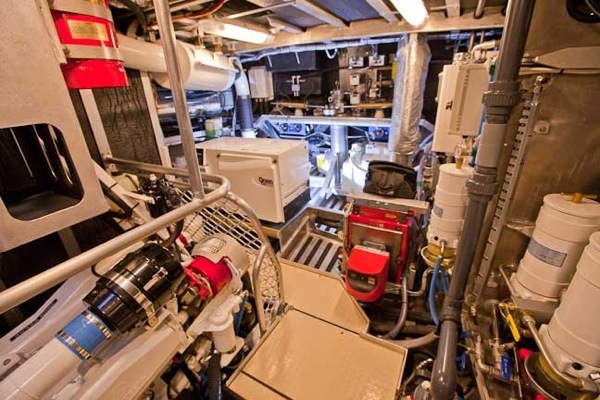 As there are hundreds of photos already posted of the engine rooms we’ll confine this set to a few details. 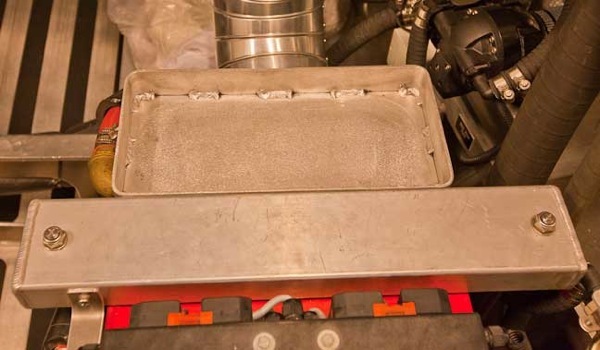 Nothing says more about working with Circa than this tray on top of the Kabola diesel boiler. When the Circa mechanics were working on the aft end of the engine room they found it difficult to keep tools and small parts handy. As a result, these permanent trays are now a part of the engine room. 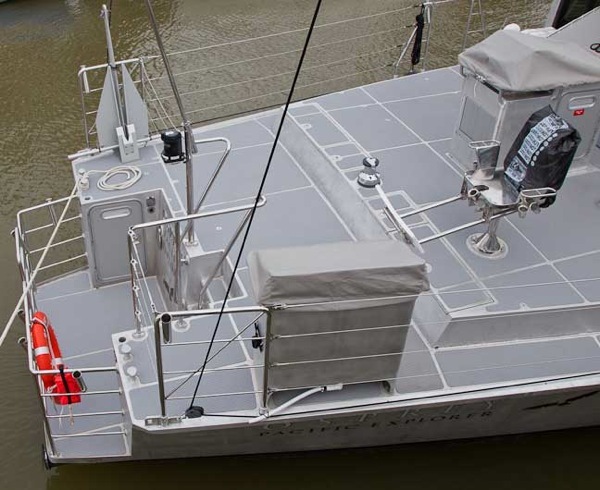 Osprey is built to New South Wales (Australia) maritime survey code for charter. They require many different details, like this stainless plumbing. You can argue the efficacy of metal versus schedule 80 PVC, but this forces the use of raw water intake strainers that require a wrench to open. 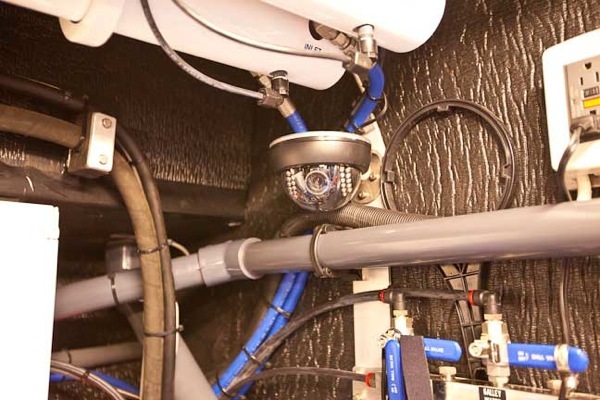 Iron Lady has an engine room video camera, as well as an aft and forward looking camera outside on the mast. 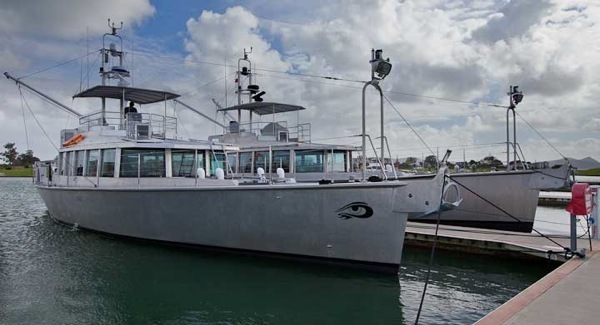 When she is not cruising Osprey will live on a mooring near Sydney. 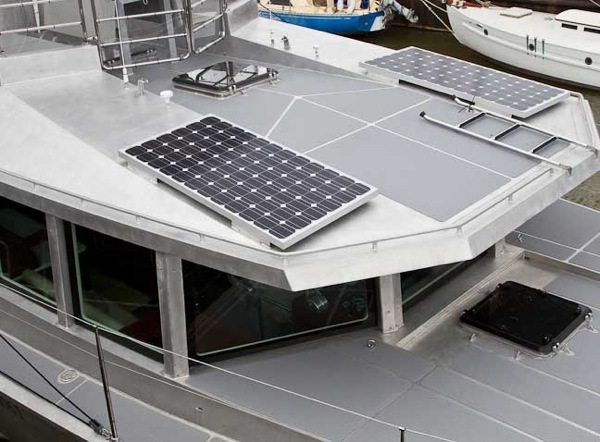 The two solar panels are intended to cover some of the fridge/freezer electrical needs (possibly all depending on sun angle and shading). A small but important detail, the entry door stop. This is part of a long and detailed check list used by Circa to insure things are as intended. 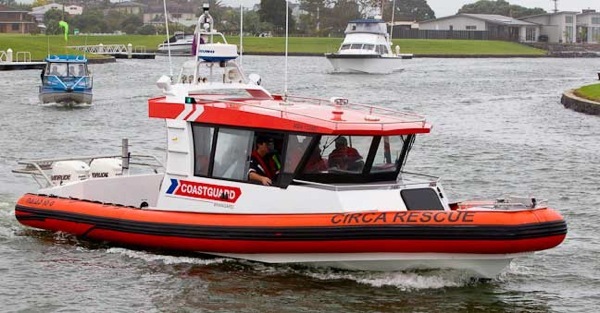 Circa builds many types of vessels, of which this rescue craft is one. 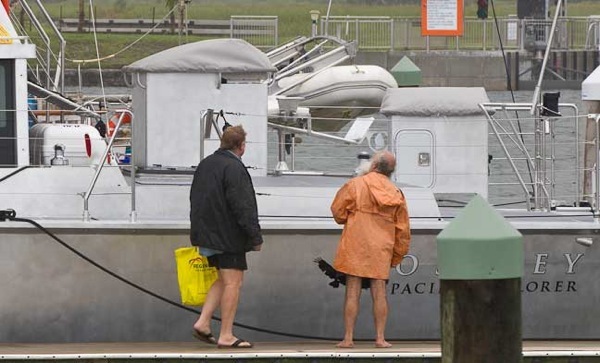 We’ll leave you with this shot of two local yachties who are wondering just what the FPBs are all about. If you are curious, contact Sue Grant: Sue.Grant@Berthon.Co.UK. These and more photos are available in full screen high def sizes by clicking here. To see hundreds of earlier FPB photos in high def click here. This entry was posted on Wednesday, March 30th, 2011 at 10:15 pm and is filed under FPB 64 Sea Trials. Both comments and pings are currently closed.